Good Stuff NW: Camp Stories: Chorizo, Chicken and Steak, Oh My! 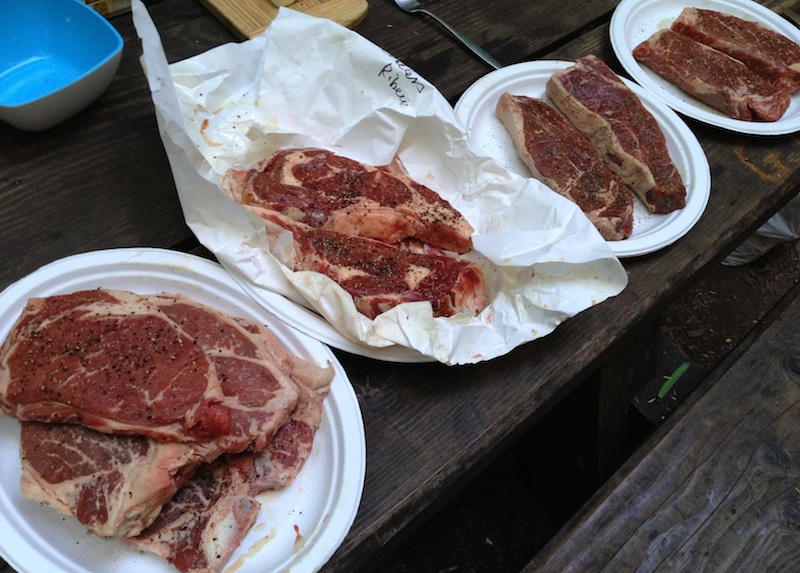 Camp Stories: Chorizo, Chicken and Steak, Oh My! Mushrooms That Taste Like Bacon? Tea ceremonies. Church services. Thanksgiving dinner. Heck, even a game of Flip Cup. All rituals with their own processes and rhythms. 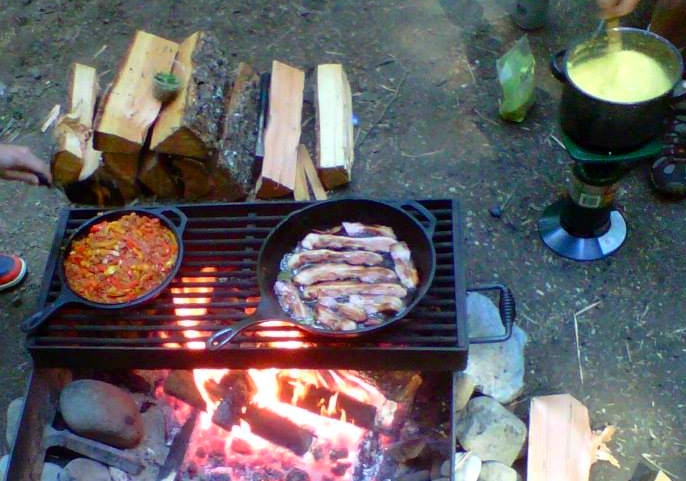 Just a little piperade, home-smoked bacon and polenta…for breakfast! 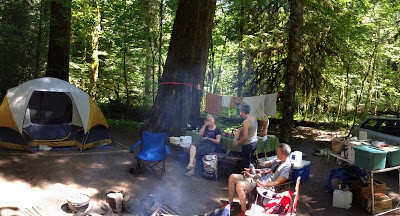 So it is with our annual Fourth of July Free-For-All camping extravaganza at Paradise Creek on the flanks of Mt. Adams. It starts with reserving our campsites at the crack of the new year in January to get our creekside spots. The first haphazard organizing starts in early June with e-mails going back and forth about head counts and guesses about the weather, really just an excuse to vent some excitement about the trip. Fresh oysters? Don't mind if I do! This year the group consisted of 11 adults, one toddler and five dogs sharing three campsites. Two of our regular crew couldn't make it, so two victims…um, I mean, friends…were asked if they'd like to come. A couple from San Francisco, they were city folk who'd never been camping before, and to everyone's amazement (and delight) they accepted. A week or so ahead of time there was a flurry of messages about what people were bringing, and one of the more organized among the group devised a loose menu. We volunteered a few pounds of Dave's home-smoked bacon and a few dozen eggs from a friend's chickens. I offered to make chorizo tacos the first night, since I'd run across some crazy good chorizo at the Beaverton Farmers' Market. Called Don Felipe, it's made by Salud and Angela Gonzalez in the style of their native Toluca, Mexico. It was paired with a cabbage slaw and local Don Froylan cotija cheese, all nestled in fresh handmade tortillas from Por Que No (at $3 a dozen, a steal). Steak for 11? No problem! A group that size meant there was a plethora of activities to choose from, including hiking, reading by the stream, playing board games, napping, going for a beer at Backwoods Brewing in Carson or just hanging out. There were several cocktail-meisters in the crew and all kinds of libations were shaken, stirred and poured into (gasp!) real glassware. No slackers in the food department, there were fresh oysters shucked with French oyster knives, an Asian ramen salad sided a grilled-on-a-Weber marinated chicken and there was the obligatory "Steak & Corn Night." 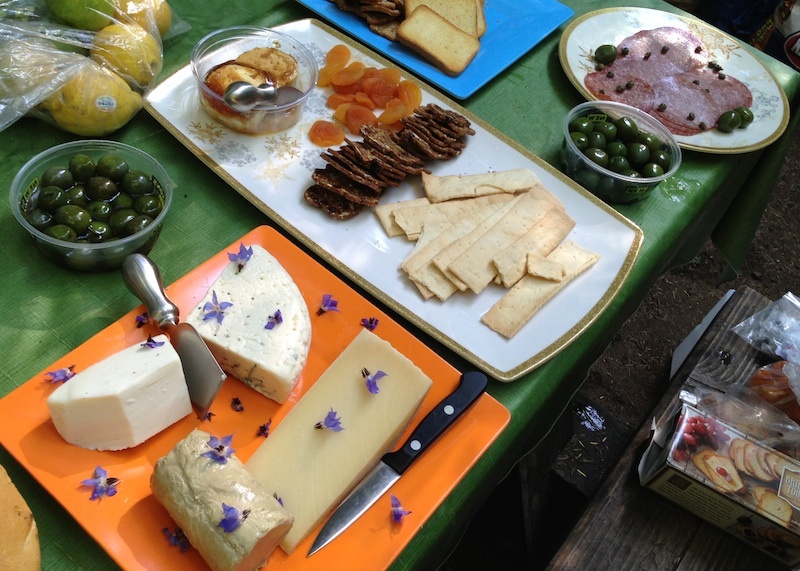 Each evening's appetizers ranged from salami to a borage flower-accessorized cheese platter to fig-accented chevre. This is a group that makes camping not just painless, but a true pleasure. Even our two newbs were convinced that sleeping on pads on the ground wasn't such a crazy thing to do…and they proved it by signing up for next year's trip. Salud and Angela's Don Felipe red chorizo is made with dried red chiles and spices, with a deep but not intense heat. The green chorizo is an intriguing and uniquely Tolucan mix of spinach, serrano pepper, pumpkin seeds, garlic, onion and spices. It's also somewhat spicy and very lovely. 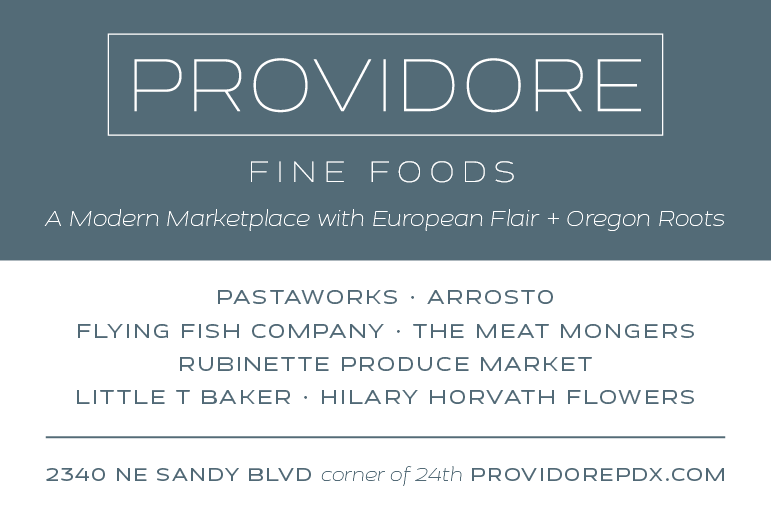 You can buy it at the Beaverton Farmers' Market on Saturdays from 8 am to 1:30 pm or at the Forest Grove Farmers' Market on Wednesdays from 4 to 8 pm. Slice each half cabbage lengthwise into quarters. Remove core by placing quarter on its side and slicing at an angle around the core. Slice quarter in half lengthwise, then slice it crosswise into thin shreds. Repeat with rest of cabbage. Place in large mixing bowl with shredded carrots. In a small bowl, combine mayo, sour cream, rice vinegar and salt. Stir until smooth, adjusting seasonings to taste (you can even add sugar, though I don't). Pour over cabbage and toss to combine. Heat vegetable oil in large skillet over medium-high heat. Add chorizo and sauté till browned. Add onion and garlic and sauté till tender. Briefly heat tortillas on cast iron griddle or skillet. 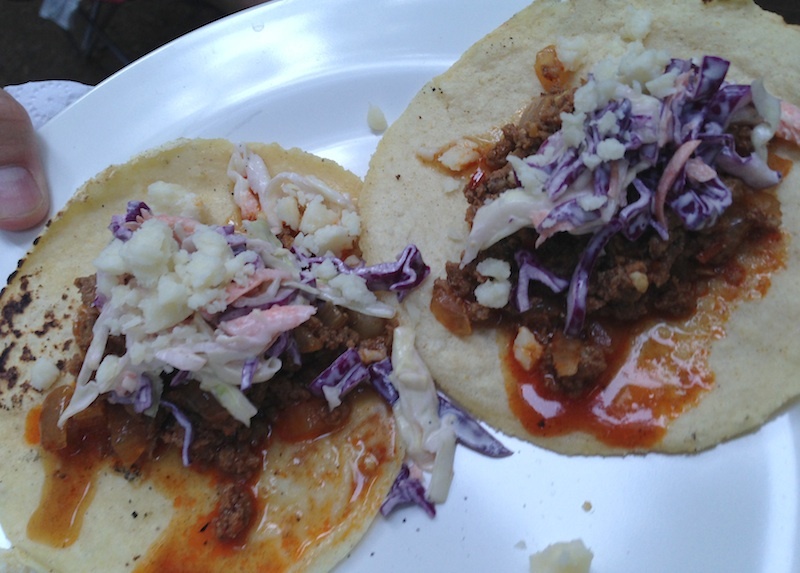 Fill tortillas with small amount of chorizo, slaw and a sprinkling of cheese, as well as sauce (if desired). Read other Camp Stories in the series: last year's trip to Paradise Creek, Trout Creek Campground, Shadow Bay at Waldo Lake, LaPine State Park, Indian Crossing Campground, Frog Lake Campground, Patrick's Point State Park, Harris Beach State Park, Moss Creek Campground and our first trip to Paradise Creek. Thinking I might steal the tacos for my upcoming camping trip. Can't wait to dig in to all your camping posts! Let me know how they turn out…and where you went, Jane! Do you recall how many people you served with this recipe? We're going to Raab Campground up the Clackamas. Between that and Riverside for the last several years. Riverside is lovely and is the only campground with water around there. But Raab is only 2 miles away. And the newly cleaned-up Bagby is only 9 miles away. 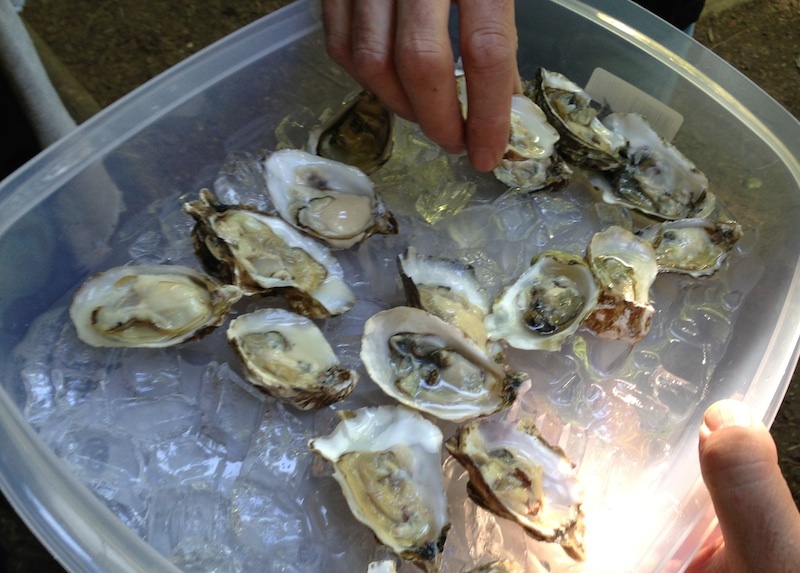 There were 11 of us, Jane…but there were oysters, cheeses and meats galore beforehand. You'll have to judge how hungry your crowd is going to be!